Sports Then and Now | Goodbye, Meadowlands! After 33 years, the final games have been played at the Meadowlands. 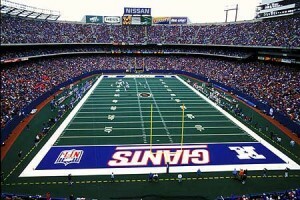 Some called it Giants Stadium. And some (namely, Jets fans) called it the Meadowlands. Come April, you can call it rubble. The former home of the Jets and Giants (and Generals and Knights and Hit Men and Red Bulls, too), a concrete monolith in an asphalt jungle, and a beacon to New Yorkers and New Jerseyans traveling State Routes 3 and 120 and the New Jersey Turnpike, is slated to be torn down the spring (but is living long enough to see this year’s impressive, improbable Jets playoff run). The Jets and Giants will remain New Yorkers as New Jersey tenants when Meadowlands Stadium opens just next door in East Rutherford. When the Jets moved from Shea Stadium and across the Hudson River into New Jersey after failing to negotiate a new lease, the Meadowlands, thanks to hosting two teams for over 25 years, passed Wrigley Field in 2003 for the most NFL games hosted. The Miracle at the Meadowlands is a forgettable moments for Giants fans. So the odds dictate that two of the NFL’s greatest games were held there. The Philadelphia Eagles beat the Giants on November 19, 1978, in the final seconds after quarterback Joe Pisarcik’s handoff to fullback Larry Csonka instead went to the turf and bounced to Eagles’ linebacker Herman Edwards. 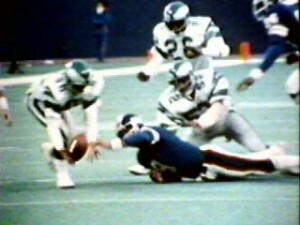 His touchdown and Philadelphia’s improbable 19-17 victory is universally known as “The Miracle at the Meadowlands”, and it led to the new “Victory formation,” where a running back lines up five yards or so behind the quarterback when taking a knee at the end of the game — just in case something bad happens. The other was voted the greatest game in the history of ABC’s Monday Night Football in a fan poll. On Oct. 23, 2000, the Jets come back from a 30–7 deficit by scoring 30 points in the fourth quarter to beat the Miami Dolphins, 40–37. Aside from those “miracles”, the Meadowlands saw the good. The Giants won two Super Bowls during their tenure there. The New England Patriots also closed out their undefeated 16-0 regular season there with a 38-35 win over the Giants. In the fourth quarter, Patriots QB Tom Brady broke Peyton Manning’s NFL record of 49 TD passes on a 65-yard touchdown pass to wide receiver Randy Moss, who on the same play set the record for most touchdown receptions in a single season with 23. 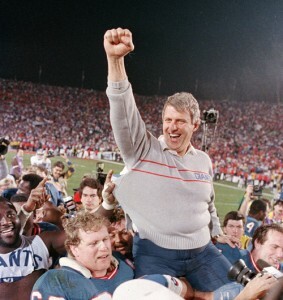 Bill Parcells led the Giants to their greatest period of success during the Meadowlands era. All that was buoyed by the bad. The Giants, who opened and closed their Meadowlands tenure with losses, were rather lackluster in the late 1970s, after moving from Yankee Stadium, and the early ’80s, prior to defensive coordinator Bill Parcells becoming the head coach and reversing the team’s fortunes. The Jets had alternating frustrating years mingled in with hope-inspiring ones. A New Orleans Saints “home game” at the Meadowlands in the 2005 opener would also fall into the bad category, as it had to be moved due to the extensive damage to the Louisiana Superdome after Hurricane Katrina. After the good and the bad, what was the ugly? Could it be various group’s attempt to mimic or compete with the NFL? The USFL’s New Jersey Generals (1983-85), the WLAF’s New York-New Jersey Knights (1991-92) and the XFL’s New York-New Jersey Hitmen also called Giants Stadium home. The jury’s still out on the UFL’s New York Sentinels, who played one game at the stadium in their inaugural season. But, it was all the other games the stadium hosted that put the “multi” in “multi-purpose stadium.” Soccer has long been a staple there. Brazilian legend Pele played in his final game for the New York Cosmos, who spent seven years in the Meadowlands during the North American Soccer League’s heyday. The MetroStars, later called the New York Red Bulls, played 13 seasons in East Rutherford; this season they’ll move to new digs in nearby Harrison. But, football fans, Jets, Giants and their division opponents all have their personal recollections. An Eagles fan too young to remember the ’78 Miracle, I recall the questionable winds, the oft lousy weather late in the year, and watching often hapless defenses trying to stop Phil Simms, Joe Morris and Mark Bavaro while hoping blockers did their jobs long enough to deflect Lawrence Taylor and Carl Banks. Quarterback Randall Cunningham, who also was an accomplished punter at UNLV, came on and bombed a 91-yard punt on Dec. 3, 1989 that bounced in front of return man Dave Meggett and went high over his head. (Unclear is if he was kicking from or toward the “Hoffa end” of the field.) Sports Then And Now’s Dean Hybl was at the game, working for the Eagles. “I remember the sound. It was the only time I’ve heard a punt from the press box without the aid of sound equipment,” he said. Cowboys, Redskins, Dolphins, Patriots and Bills fans probably also have equally quirky recollections of games at Giants Stadium, ones that won’t go into a pile of rubble sometime soon. 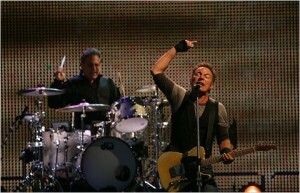 Bruce Springsteen made many memorable performances at the Meadowlands. But it was the many concerts that gave the stadium wider appeal. You hadn’t arrived in the last 25 years, lest you played the Meadowlands. Bruce Springsteen is notoriously connected to the place — he played there six nights in 1985 during his Born in the U.S.A. Tour and ten more on his The Rising Tour in 2003. He returned for five nights in October 2009 for a special sendoff. In all, 33-plus years worth of memories will be taken from that asphalt landscape later this year. The new Meadowlands Stadium won’t have grass football fields of largely dirt and paint, nor will it have the concrete-painted-green Astroturf surface. For a while, it won’t have much of anything.